Re: No links for me? Where were u trying to post? I took that screenshot on the killing floor thread. I couldn't post links on the video game remixes one. To prevent spam, we have removed users who are less than a week old to post external links. A new anti-spammers system: This new system of protection against spammers is in addition to others already in place on your forums to ensure the best possible protection for your forum. It uses a security protocol over the entire board that checks in real time the content of all posts, comments and private messages of new members with less than a week on your forum and prohibited from posting external links or emails. 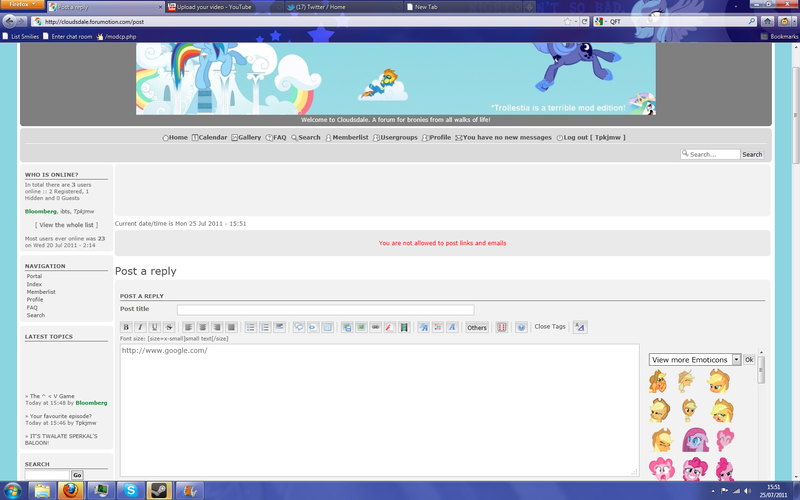 Of course, this limitation does not apply to the forum admins and moderators. I would think you're a week old already....Try to post another link. EDIT: If you still can't post links, I'll turn the post limitation off. Ah, works now. Thank ye.